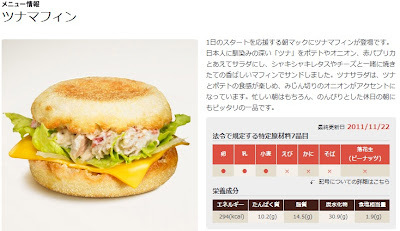 Before leaving for this trip to Tokyo, I saved a digital coupon for 100Y off the new Tuna McMuffin (simply called the 'Tuna Muffin' in Japan) but a few days before I arrived I noticed that it had been removed from their website. 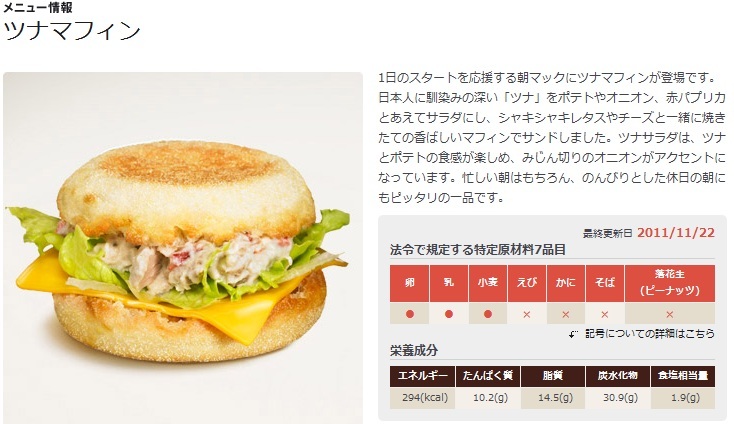 Though my coupon said it was valid for 3 days after I arrived, I wondered if it had been removed pre-maturely, a Tuna McMuffin never sounded very appetising, and with the recently sky rocketing Tuna prices, I assumed I wouldn't be able to try it. 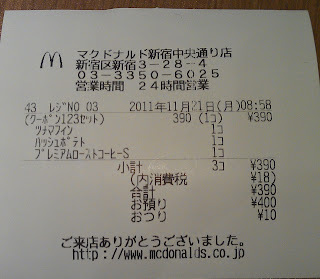 After walking for the last 4 hours, I searched out the McDonald's near Shinjuku Stn (photo of the storefront). I had been to this branch a few times as it is near my friend Eriks old flat and I knew I would be able to get free WiFi from the neighbouring Seibu Department Store (free working WiFi is near impossible to find in Japan). 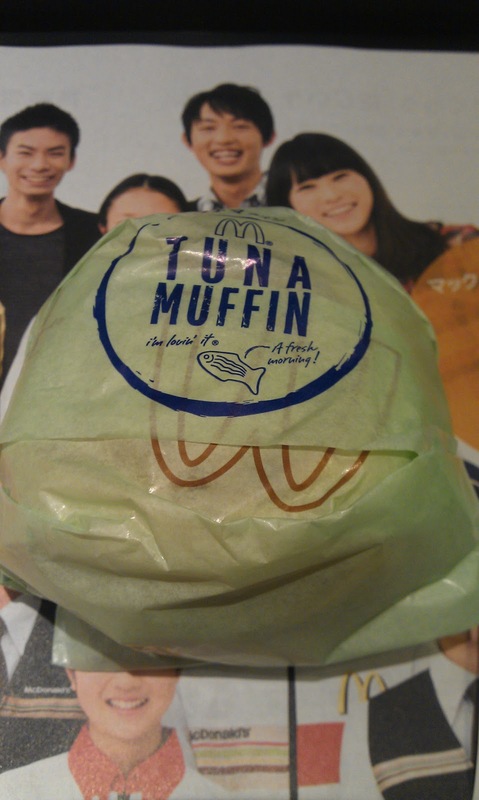 When I arrived I didn't see any promotional material for the Tuna Muffin and when Japanese McDonald's has a limited item, they usually have big signage promoting it. But even with the lack of signage, I still showed the coupon from my phone and the server had no problems getting it ordered for me. I guess the problem with the lack of promotional material was that no one else knew about the Tuna Muffin, so when I received it, the tuna inside was very, very cold. 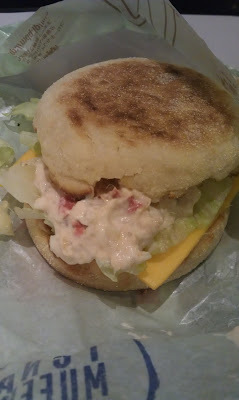 I guess it was straight out of the refrigerator, so the muffin and cheese were hot as it was just the standard McMuffin setup, but with the tuna being so cold, the contrast made it slightly off-putting. Also, as is common in many Asian sandwiches, it was not 100% tuna, but tuna and a whole lot of mayonnaise. I don't generally like tuna and mayo together, but this mixture wasn't that bad, just needed a little black pepper to make it taste pretty good. I also questioned the addition of cheese on it, personally I think the egg would have worked better with the tuna, and made it a little more filling breakfast sandwich, as it currently was served, it only had ~290kcal, so with a black coffee, it wasn't nearly filling enough meal. Not on my ordering list, but interesting.